Ronan MacLochlainn was shot dead by gardaí during an attempted armed robbery of a Securicor van in Ashford in 1998. A REPORT INTO the shooting dead of republican Ronan MacLochlainn by gardaí during the course of a Real IRA attempted robbery in 1998 is to be critical of the actions of An Garda Síochana. However, it is understood the report of the MacLochlainn Commission of Investigation, which is due to be published on Thursday, will state that the shooting of MacLochlainn was justified. The inquiry, which has been hearing evidence for the last four years, was set up to investigate the shooting dead of MacLochlainn by gardaí during an attempted armed robbery of a Securicor van in Ashford, Co Wicklow, in May 1998. It happened on the day of ‘blue flu’ unofficial garda strike action on Friday 1 May. The men who carried out the raid were armed but they did not discharge their weapons. During the course of the inquiry, the Commission heard that garda vehicles left the scene in the immediate aftermath of the incident. The Commission was told that members of the Garda National Surveillance Unit (NSU) left the scene at an early stage following the shooting, removing their 4×4 vehicles, and possibly disturbing aspects of the scene. The inquiry was established after Mac Lochlainn’s partner, Gráinne Nic Gibb, took a case against Ireland under the European Convention on Human Rights in 2010, alleging a failure on behalf of the State to carry out an effective official investigation into the shooting, in accordance with the terms of Article 2 of the convention. A Commission of Investigation was proposed as a means of ensuring the State’s compliance with the Convention. It has been twenty years since the shooting, but at the time the inquiry was established some four years ago, Nic Gibb said she hoped the Commission would shine some light on what happened that afternoon in 1998. Her concerns are in relation to the planning of the Garda operation, whether the incident could have been stopped at an earlier stage, and the failures of the subsequent investigation into her partner’s death. The Commission was told that she was very concerned about the first Garda press statement that was released after the incident which stated that the shooting of her partner was necessary as officers had come under fire. She questioned how such a statement could have been expressed to the national media. Speaking at the time, the then Minister for Justice Frances Fitzgerald said the government believed the matters around MacLochlainn’s shooting “are of significant public concern”. She said the Commission would seek to establish whether or not the Garda’s use of force on the day was proportionate and justified. 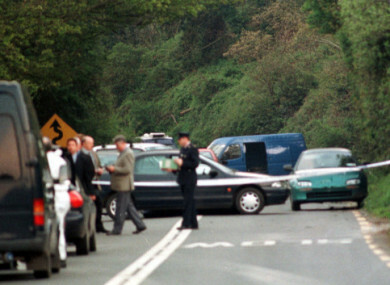 During the course of the hearings Senior Counsel for the Commission Roderic O’Hanlon outlined that on 1 May 1998 gardaí had two vans under surveillance and followed them from Dublin to Ashford. A third vehicle, a gold Corina car, was also followed by gardaí. The commission was told by Senior Counsel for the Gardaí Michael Durack that although the NSU was involved in the surveillance of dissident republicans, it had no intelligence as to what the men they were following were planning on the day in question. However, it became apparent that a Securicor van that travelled to Ashford weekly was the target. The Commission was told that when the Securicor van approached the Cullimore Bends in Ashford, the vans that were being followed by gardaí blocked it and the surrounding traffic. Four people who had been in one of the vans – which was coloured blue – attempted to gain access to the security van. One driver had fled the Securicor van. The other had pressed the emergency button, locking him in the vehicle. Gardaí were at scene within minutes, with the emergency response unit and the NSU both attended. The Commission was told that the four men involved in the robbery were forced to flee. Ronan MacLochlainn ran down the road and hijacked a Mazda car from an elderly couple. MacLochlainn, who had a handgun on him, ordered the driver – an elderly man who had just had heart surgery – out of his car. He then attempted to do a u-turn. The Commission heard that MacLochlainn pointed his gun at gardaí as he ran towards the car, resulting in a garda discharging his weapon. However, MacLochlainn made it to the vehicle unharmed. In evidence presented to the Commission, a second garda said MacLochlainn pointed his gun out of the window when he had gained access to the car. That garda discharged his weapon twice, hitting the rear of the car. A third garda, who was approaching MacLochlainn in a car, saw McLochlainn pointing a gun at his garda colleague. The garda held his weapon outside his car window and opened fire as the vehicle was moving towards MacLochlainn. MacLochlainn was shot in the chest. He was subsequently removed from the vehicle and handcuffed. When it was noticed that he had been shot, the handcuffs were removed. He later died at the scene. A number of weapons were found at the scene: one sawn-off shotgun with 18 live rounds, a Magnum revolver with six live rounds, and an assault rifle with 28 live rounds. Other items found were a hammer, a saw, a chisel and a weapon made to look like a RPG rocket launcher. A modified fire extinguisher capable of launching flames 20 feet was also discovered. It was later discovered that no weapons were discharged by the men involved in the robbery. The Commission was told that the NSU were not known to the public and at the time, their job was to keep targets under surveillance. At this time, the vast majority of their work involved targeting subversive units in the north and south. Giving evidence in 2015, former Assistant Commissioner Dermot Jennings outlined the job of the NSU. He said at the time their main focus was terrorist organisations and the Real IRA. Jennings said the national unit was established in 1992. The unit was kept separate from the rest of the force due to security reasons. He told the commission that members of the unit received intensive and specialised training to a very high standard. They also received international training and were highly equipped with firearms. Jennings said members were “hand picked” from the force, and just three out of eight were picked after the intensive training. Following this, they were placed on probation and more training would then take place. The unit were involved in surveillance on the ground and charged with establishing who was leaking intelligence to active defectors. The Commission was told that members of the NSU would “not have wanted to stay at the scene” and while the scene of the attempted robbery was preserved under protocol, the scene of the fatal shooting of MacLochlainn was not, insofar as the vehicles driven by members of the NSU were removed from the scene. The subsequent walk-through of the shooting scene by investigators therefore did not include the vehicles that had been there at the time of the shooting. Garda Sergeant Martin Allen, who took photographs of the scene on the day, said he recalled seeing a jeep leaving the scene. The logs record him as arriving there after 8pm. He said he recalls being briefed as to what had happened. He said that in hindsight it would have been appropriate to tell the garda photographer that cars had been removed from the scene. He said it is his job to record and preserve evidence of the scene. Allen said he would have preferred evidence to have been left in place, adding that it is important that items are not moved or removed. When asked did he take photos of the Mazda car, the vehicle in which MacLochlainn had hijacked, he confirmed he had. The car had significant damage to the front of the vehicle, the commission was told, due to a car hitting it. When Hartnett asked Allen if he was informed about the vehicle that caused the damage to the Mazda, he said that it had been a long time ago, almost 17 years. “I don’t believe I was informed”. He was then asked did he inquire as to what had caused the damage to the Mazda car. “I may have asked that but I just can’t recall.” He said it was probable that he did ask, but said he had no memory of it. The Commission’s final report, which was noted by Justice Minister Charlie Flanagan at Cabinet yesterday, is due to be published on Thursday. Email “Report on how an IRA armed robbery went drastically wrong set to criticise gardaí”. Feedback on “Report on how an IRA armed robbery went drastically wrong set to criticise gardaí”.